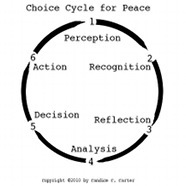 Making a decision that supports peace optimally happens in a cyclical process. It involves six deliberate steps that support best action. Ultimately, use of the process avoids or transforms conflict. Humans can learn the process as they mature. While young children lack the ability to perceive from another’s point of view, maturing youth and adults learn how to take another perspective and consider it in decision-making. The need for learning evidences the importance of teaching how choices are made. Engagement in the proactive process advances the skill development of a learning observer, while refining one’s own reaction habits when faced with conflict. While it is difficult, when possible, to change the behaviors of another, changing one’s own is in the control of a healthy mind. A temporarily unhealthy mind that is gripped with emotions needs to de-stress before engaging in a decision process. In that situation, the immediate goal is reduction of stress through an activity that is not harmful, thereby delaying the larger decision. Once calmed, identification of the self-need that the emotions indicate can happen. Then choices for how to meet that need can be generated and evaluated. Incomplete, thus ineffective, choice processes that have been observed need to be unlearned. For example, watching a character in a show make a choice to use harm in response to conflict becomes part of the observer’s schema, or mental framework, unless critical analysis of that choice occurs. Mindfully responding to the observation involves analysis of the action with identification of its counter-productivity for peacemaking. Discussion about this with children stimulates their skill development and builds their value foundation. Good decisions result from cultivation of a protection value and corresponding skills. A person who knows that protection is a goal in the midst of conflict has a clearer task in the choice process. Learning new behaviors, including ways of thinking and behaving, result from self-monitoring in a framework where a goal for changing them has been set. People must set their own goal. The goal of peace needs to be clear for its actualization.